Planning a Wedding, or hosting a Banquet? We want your event to be everything you’ve dreamed of and beyond. From our enchanting aerialists to our characters and comedians, we are excited to be a part of your experience. We offer all kinds of performance types, catered to the size, theme, and specifications of your event. Rose City Circus wants to provide you with the best entertainment possible. We offer several various entertainment packages which may consist of one or many styles of performance. Specific forms of talent, such as fire and aerial performance do require certain conditions within the venue and event specifications. Performers are integrated into the crowd creating an interactive environment. 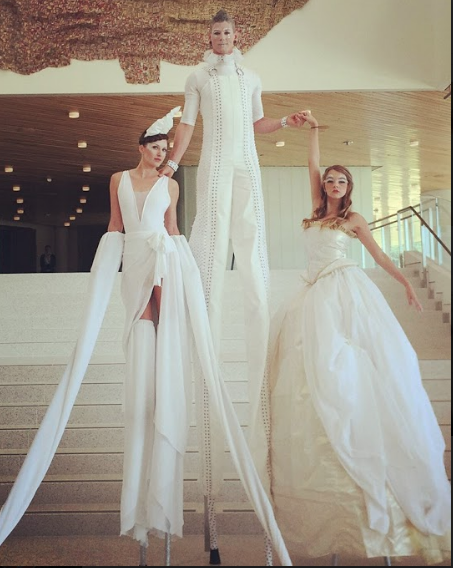 Stilt-walkers tower over the crowd while jugglers and characters engage the guests from among their midst. There’s no better way to pour champagne than from upside down, hanging high, or spinning ’round. Women of many talents, our aerial bartenders are happy to serve classic drinks in a modern way.